A shallow hairline/coronary band angle is a good indicator that heels are too high - a normal front foot has a hairline angle of approx. 23.5 degrees - if the angle is much less than this, the palmar angle and therefore the heels are likely to be too high, i.e. there may be rotation. 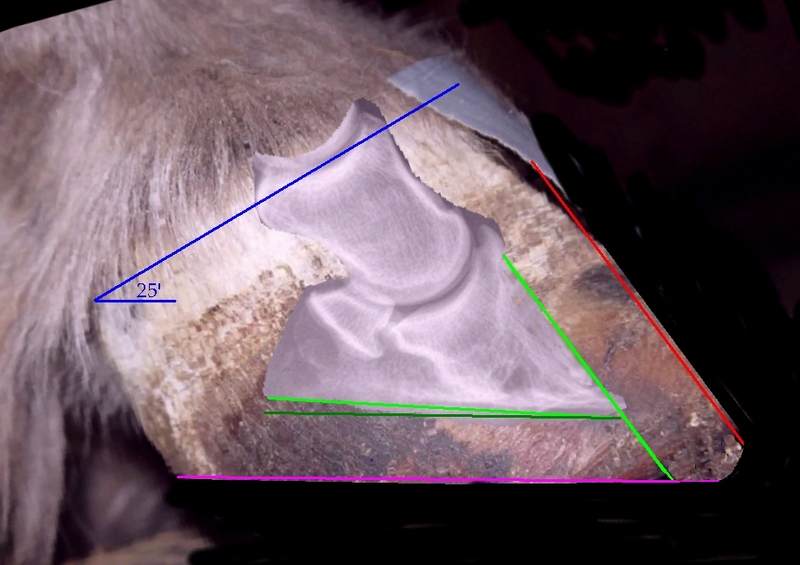 "The angle of the coronary band can be used to estimate the position of the distal phalanx within the hoof capsule. The angle of the coronary band of apparently normal front feet is 23.5 +/- 3 degrees." ".. a coronary band parallel to ground (as viewed from the side) is indicative of a high palmar angle, which is often associated with a club foot or laminitis." Above: viewed from the side of the foot, a line (dark blue) is drawn along the hairline of the coronary band from the toe to the heel, and the angle this line makes with a line parallel with the ground is measured. This hoof has a hairline angle of approx. 10 degrees. 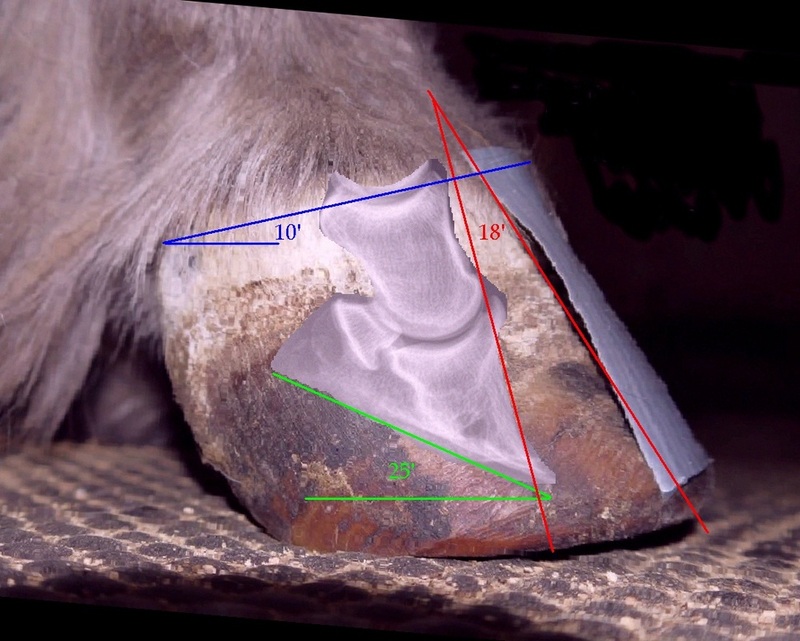 Note also that the heel height is not much less than the toe height (turquoise lines) - the hoof has a square shape. Above: on a well balanced hoof the hairline (dark blue) will be approx. 23.5 degrees. 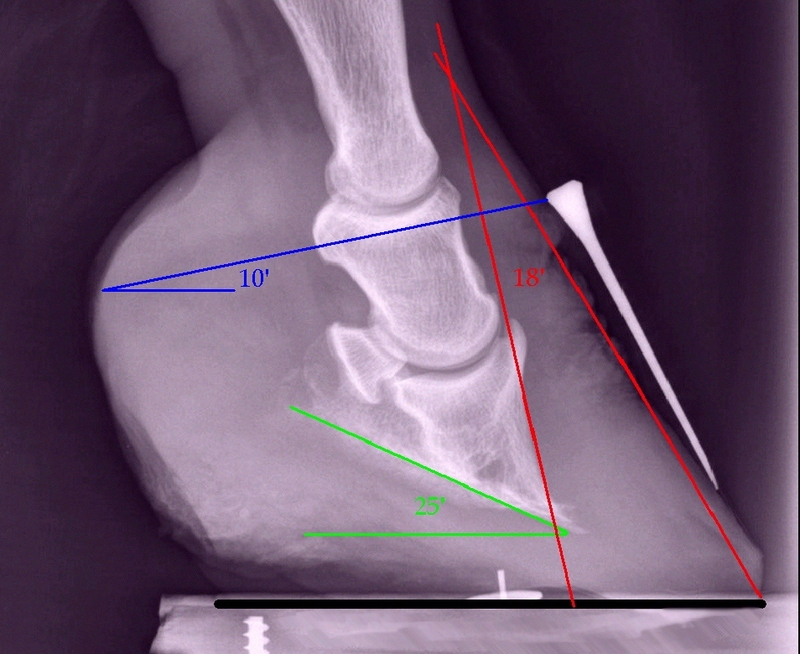 During laminitis rehab a smaller than normal palmar angle may be required (2-3 degrees rather than around 5 degrees for a healthy horse) to reduce pressure under the tip of the pedal bone, therefore a hairline angle of around 25 degrees (as shown here) may be a reasonable aim. 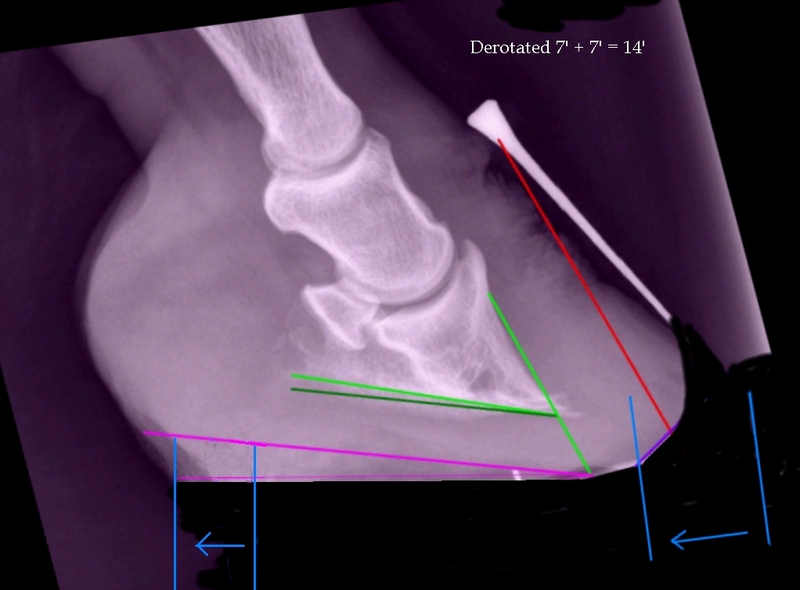 Note how the heel height is significantly less than the toe height (turquoise lines) - the hoof has a triangular shape. Palmar angle (green) - approx. 25 degrees (should be between approx. 3 and 5 degrees, possibly slightly less for rehab). Dorsal angle (red) - approx. 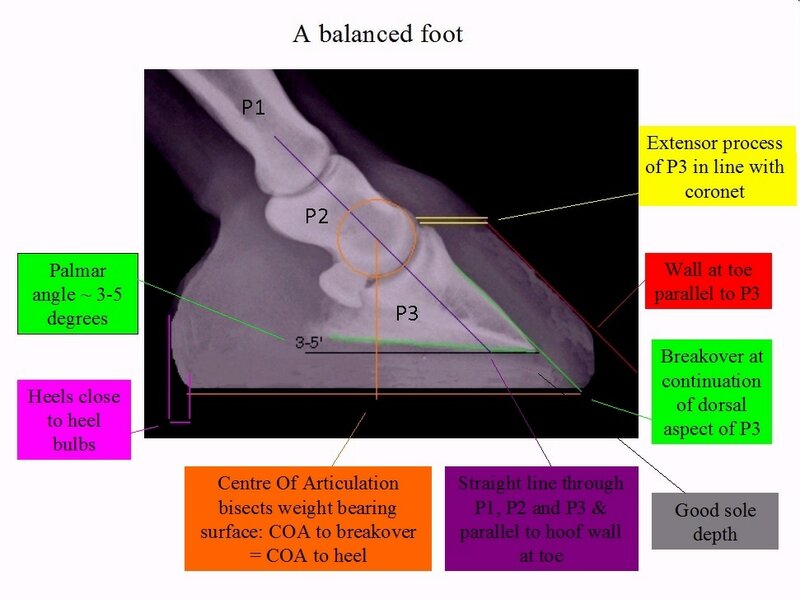 18 degrees (should be 0 - the hoof wall at the toe should be parallel to the dorsal aspect of the pedal bone. Hairline/coronary band angle (blue) - approx. 10 degrees (should be approx. 23.5 - 25 degrees for rehab, possibly slightly more). Below: compare the parameters of the high heeled foot to the balanced foot - the only parameter that is not incorrect is the sole depth, which luckily has been retained. 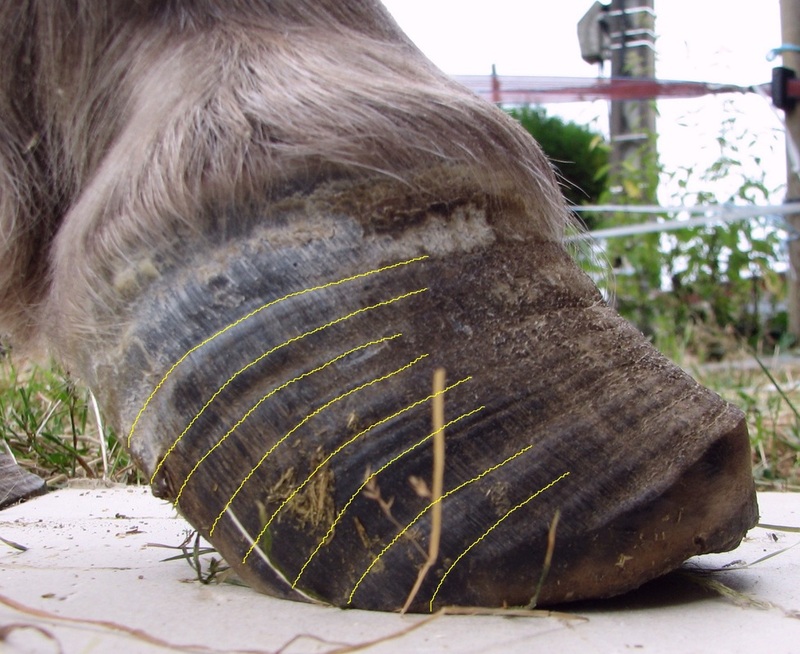 A healthy hoof should not have uneven growth rings. Growth rings that are wider at the heel and narrower at the toe are often seen in horses with chronic laminitis. Narrowing of the rings, i.e. reduced hoof growth, is likely due to reduced blood circulation in the corium at the coronary band and/or abnormal loading of the hoof. Divergent hoof rings (wider at the heel than at the toe) are often seen when heels are too high - never ignore the writing on the wall - find the reason for the abnormal growth and correct it. Red - the line the toe will eventually take. This is not trimmed - no wall at the toe is removed above the bottom third of the foot. Instead Purple - breakover is brought back with a bevel (of around 30 - 45 degrees). 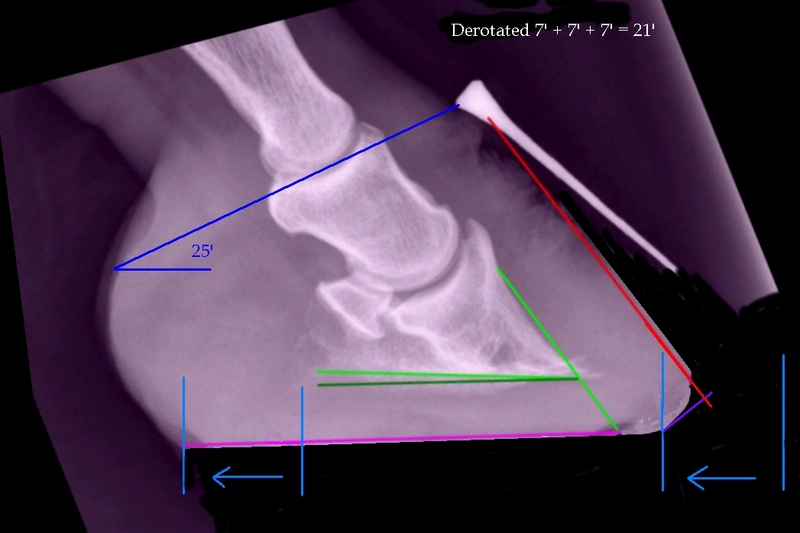 Breakover could be between a line projected down the dorsal aspect of the pedal bone (green) and the line the toe will eventually take (red), indicated by the yellow line. 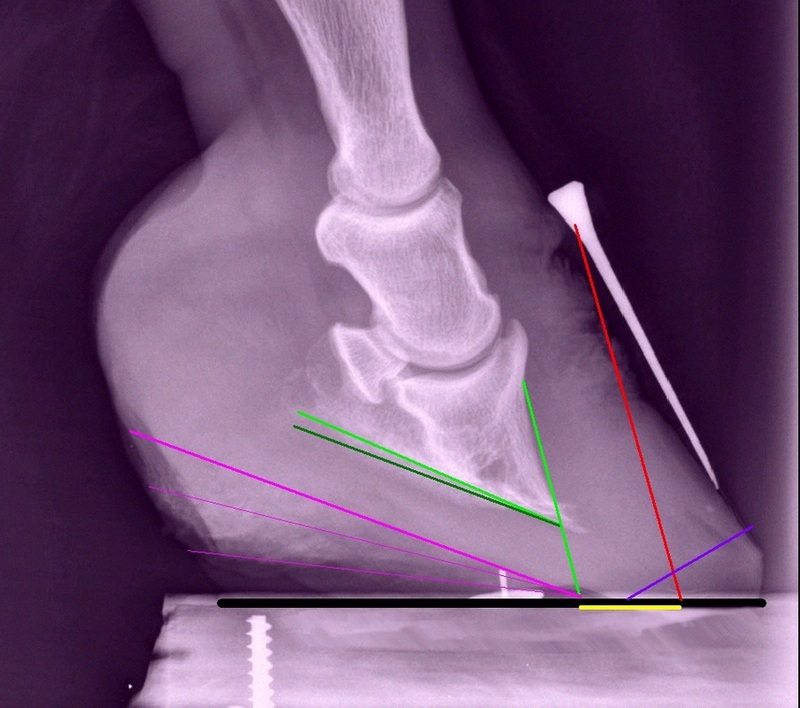 As this foot has some remodelling of the tip of the pedal bone, the mid-point has been suggested for breakover - Pete Ramey suggests that horses with P3 remodelling may need a less aggressive approach (p 335 Care and Rehabilitation of the Equine Foot). Pink - the solid pink line indicates the heel trim required to return the palmar angle to around 2-3 degrees, which may be suitable during rehabilitation to reduce pressure on the tip of the pedal bone. After rehab, a palmar angle of around 5 degrees may be more suitable to ensure the palmar angle of the bone does not become negative during exercise. With a large degree of palmar rotation, the heel height should be reduced slowly over a few trims ideally just a few days apart (as quickly as the horse is comfortable with), removing no more than 1 cm of heel height in one trim to reduce the risk of soft tissue damage. The light pink lines suggest the progression of trims required to return the foot to a normal palmar angle. Left: After an initial trim taking the heel to the lower pink line and reducing the palmar angle by around 7 degrees, the foot should look like this. Breakover has been brought back significantly with a bevel, but little has been removed from the wall at the toe much above ground level, so the hoof retains strength and protection. 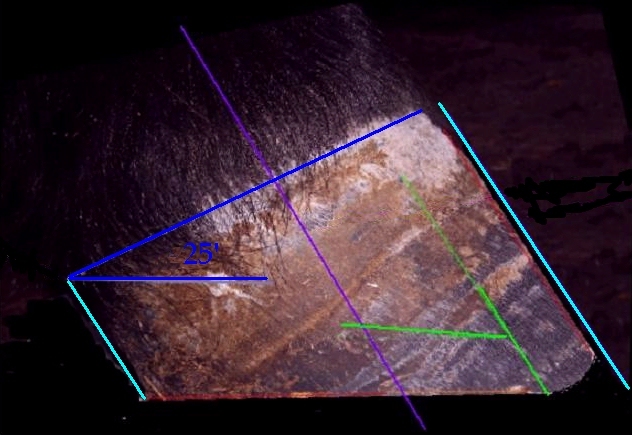 The blue lines indicate how the weight bearing surface has been brought back under the horse. Below left: After a second trim to take the heel to the middle pink line and reduce the palmar angle by a total of around 14 degrees, the foot should look like this. Breakover is kept in place by renewing the bevel at each trim. Note that the back of the foot is now bearing more weight and the distance between the heels and back of the heel bulbs has reduced. Below: A third and final trim lowers the heel to return the palmar angle to around 2-3 degrees. The toe will have grown down correctly and will soon look like this. The hairline angle should be around 25 degrees. 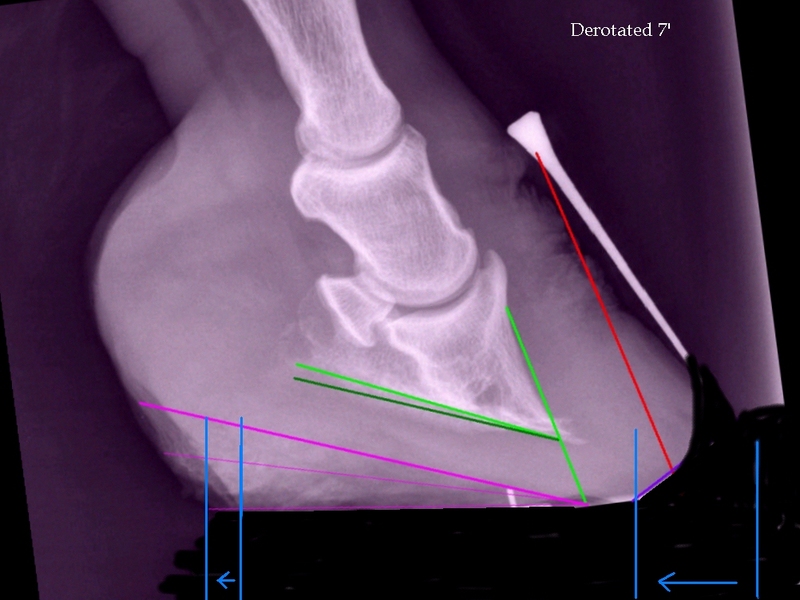 The blue arrows indicate that the weight bearing surface of the foot has moved significantly back underneath the horse. Below: The foot before and after a realigning trim, showing how lowering the heel derotates the pedal bone. 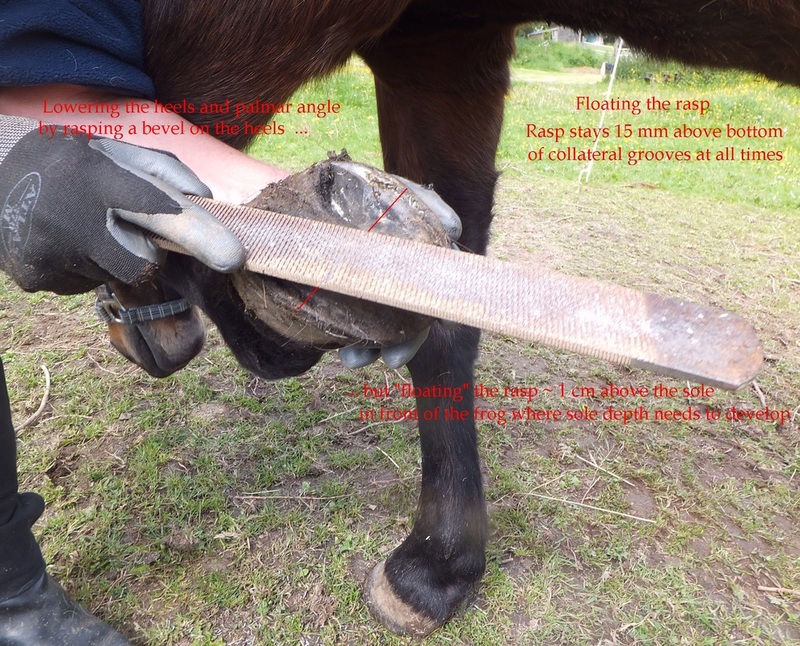 It will be impossible to correct the palmar angle of most horses with rotation without applying a heel bevel which will leave the hoof in two planes at ground level, and this involves "floating the rasp". 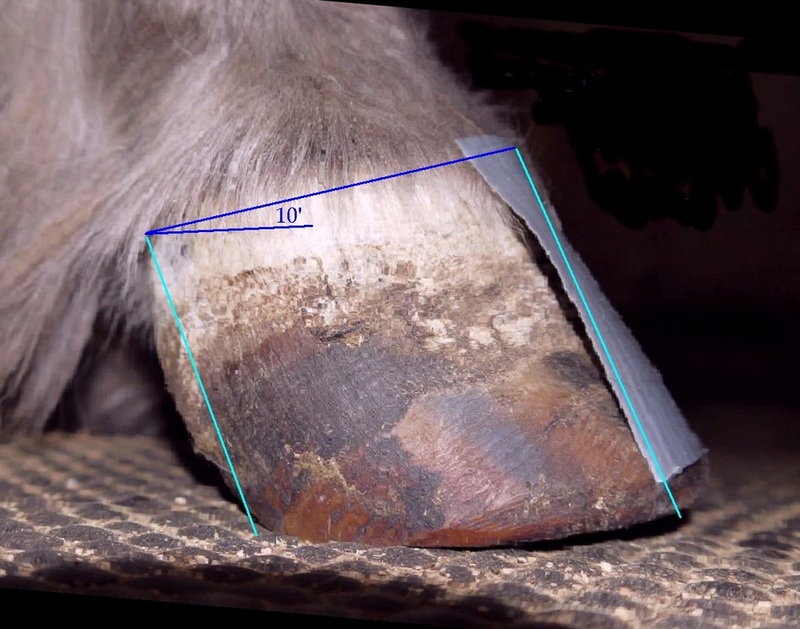 See video 4 in Linda Cowles' medial/lateral hoof imbalance trim series, around 3 mins 30 secs.